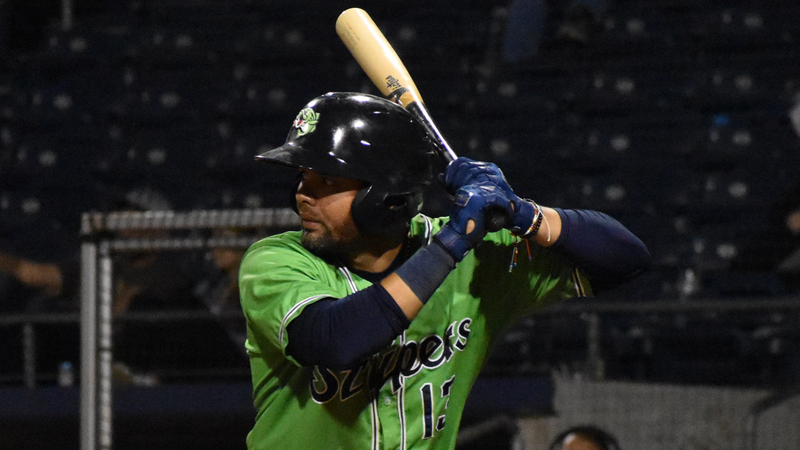 LOUISVILLE, Ky. - The Gwinnett Stripers (4-3) squandered a 4-0 lead and lost to the Louisville Bats (4-4) by a 7-6 score Thursday night in the opening game of the four-game series at Louisville Slugger Field. Andres Blanco went 4-for-4 with a home run and four RBIs in the loss. Scoring Recap: Gwinnett took a 1-0 lead in the top of the first inning on an RBI single by Blanco off Bats' starting pitcher Keury Mella. The lead was pushed to 4-0 in the top of the second when Blanco (1) hit a three-run homer off Mella. In the second, a two-run homer by the Bats' Aristides Aquino (2) off Stripers' starting pitcher Bryse Wilson cut the lead to 4-2. Raffy Lopez (1) smashed a solo homer in the top of the third to extend the lead to 5-2; however, the Bats scored four unanswered runs off Wilson. A two-run homer by Brian O'Grady (2) in the bottom of the sixth put Gwinnett in a 6-5 hole. O'Grady (3) added a solo shot off Corbin Clouse in the eighth for a 7-5 Louisville lead. The Stripers loaded the bases in the ninth, but were only able to score one run, falling 7-6. Stripers Stats: Wilson (L, 0-2) pitched 6.0 innings, gave up eight hits and six earned runs on 93 pitches, 64 strikes. Clouse went 2.0 innings with one hit, one earned run and two strikeouts. In addition to Blanco's four-hit night, Rafael Ortega was 3-for-5 with two runs and Lopez was 2-for-4 with a solo homer. Travis Demeritte was 1-for-1 as a pinch hitter. Bats Stats: Mella lasted only 3.0 innings and gave up six hits and five earned runs in a no-decision. Former Gwinnett and Atlanta pitcher Ian Krol (W, 1-1) pitched 1.1 scoreless innings with one hit and one strikeout for the win. Anthony Bass (S, 1) picked up the save by working out of a bases-loaded jam in the ninth. O'Grady was 2-for-4 with two homers and three RBIs. Aquino was 1-for-3 with a homer and three RBIs. Christian Colon was 3-for-4 with two runs. Postgame Notes: The two teams combined for five home runs in the game. Wilson, the Atlanta Braves' No. 7 prospect according to MLB.com, is now 0-2 with a 7.36 ERA in two starts for the Stripers this season. Gwinnett has now lost nine in a row at Louisville Slugger Field, the last win coming on July 1, 2016. Next Game (Friday, April 12): Gwinnett at Louisville, 7:00 p.m. at Louisville Slugger Field. RHP Mike Soroka (1-0, 0.00 ERA) for the Stripers vs. RHP Vladimir Gutierrez (1-0, 3.38 ERA) for the Bats. Radio Broadcast: 6:45 p.m. on 97.7 and 93.5 FM "The Other Side of the River."